Broadland Country Sports is owned by James and Donna Chapman. The Chapman family have farmed the area for many years with James being the fourth generation. James continues to run the family farm growing a wide range of crops from barley for a local brewery to peas for the frozen market and grass to produce hay and haylage for our own use and to offer for sale through the store. Donna comes from a retail background but has also worked and managed a livery yard. Managing the store is Tina Coe, sister of Donna. Tina is assisted by Emma Cole and Gemma Johnson, both Tina and Emma are also from a retail background and also enjoy looking after their own horses based on the farm. 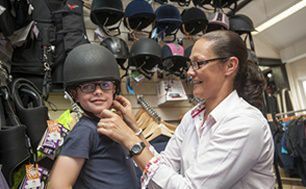 Using their combined knowledge of the game, farming and equestrian industries James, Donna and the team select products for the store that their customers can rely on. They are also on hand to give advice on what products are best for your requirements.